Dads, If you have been looking for an upper body workout that incorporates in some aerobic exercise as well, I have the perfect routine for you. To start out with, you will need an approximately 35lb weight, and it has to be at least 3ft long. Got it? Good. Now, what you will need to do is to stretch out your arms directly in front of you and lay that weight directly perpendicular across the top of both arms. Easy enough, right? Now, keeping your arms stretched straight out as long as you can with the weight still laying over them I want you to start running around in circles. These don't have to be perfect circles, mind you. In fact it would be better if they were fairly random, but be sure to lean heavily into each turn. Next, once you have done a couple of these circles, I want you to begin to lift your arms up and down while running around. Depending on your level of fitness, by this time you may begin to feel a bit of a burn. Nevertheless, you must keep running around in random circles while lifting your arms up and down, varying your speed. Do this exercise for as long as you can. Once completed, that is considered one set. On the second set you may want to incorporate an additional level of difficulty into this exercise. I suggest finding a fairly open area, say a pre-school playground, and preforming the exercises there. By choosing such a location, you may be able to incorporate any kids who may be playing there into your routine. As you are lifting your weighted arms up and down, simply swoop them at the surrounding youngsters, being careful to come close but being sure to avoid direct contact. You may find, as I did, that these children will consider it a game to try to catch the weight that is on your arms thus giving you added incentive to be fairly elusive. If this happens you must be careful however, as more and more children may decide to participate eventually leading to a diminished area to preform your circles. Just see how long you can keep this up for maximum effectiveness. So, there you have it. A fun new aerobic, upper body workout for dads. Just be careful not to overdo it. Not unlike Gulliver, you may end up out of breath, surrounded by a slightly crazed crowd of little people. Do Astronauts Dream of Floating Sheep? It was a warm day in Seattle Sunday, so we had set up a floor fan in his room to keep the air circulating and cool things off, so she wanted to check out the temperature in there. When she returned, she was smiling. "What?" I asked, knowing something made her happy. "He's sleeping. But he's in his bed, with his astronaut costume on over the top of his PJ's" She replied. "And his astronaut helmet is under his arm!" 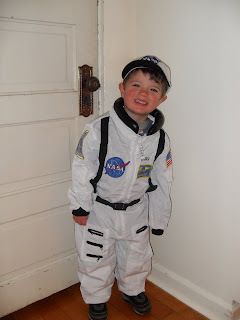 ﻿He hasn't had that costume out in a couple months, but nearly every day he is role playing being an astronaut and going to space. Now, it seems, he is dreaming about it too. ﻿Now that the Space Shuttle Program has officially ended, NASA or perhaps private companies working on their own space exploration ventures, will hopefully have a viable new program operational in the near future. They should be able to do it in 20-25 years, right? Arrrg. I lost another pair of sunglasses this week. I'm bummed because these were actually a pretty nice pair for my face. No, that's not typical. For whatever reason it's fairly difficult to get shades that fit snugly over the bridge of my nose without riding so close to my eyes that my lashes rub against the lenses. Not unlike the freakishly large head of Loraine on Seinfeld, I must have a freakishly odd shaped face for shades. Seriously though, I have torn through at least 6 pairs since last fall. Maybe it's partly because I always buy cheap sunglasses. I usually get them at a local drugstore - when they are on sale, of course. But since the only mirror I can ever find at these stores is the tiny 3" x 3" one above the display I can never truly tell whether the shades look good on me, or make me look like...well, like a guy with a goofy looking pair of shades. Unfortunately, I get more than my share of the later. I actually had a pair for our trip to Hawaii that I bought at an old folks home thrift store. Don't laugh, those were stylin eyes. And they were only 2 large. Washington's that is. But typical of all good shades I find, I lost that pair on the trip. That was a tough pill to swallow, especially only half way through our vacation. I ended up using my backups, which sat funny on my nose. I never loose the crappy pairs. Just the ones that fit. Like I said, I lose a lot of pairs. It's a Seattle thing. Those of you who live in places were the sun makes a consistent appearance between the months of April and September probably don't lose as many pairs because of one simple fact. You are wearing them! 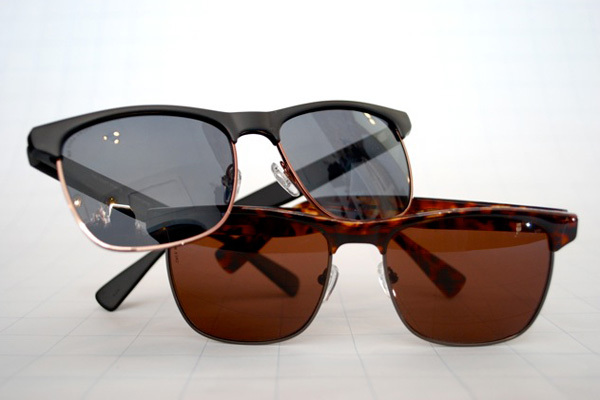 You probably don't know this, but Seattleites buy more sunglasses per capita than anywhere else in the USA. That's because here in Seattle the sun is often more hit and miss than the Mariners offense. Trust me, that's a lot of misses. I know this may come as a shock to those of you toiling under the oppressive heat in the Midwest right now, but Seattle has had all of...count em....74 minutes of Summer so far this year (defined as 80F or higher temperature). Actually, I'm not complaining. I'll take today's 72F with a cloud cover anyday over the 132F heat index that Minnesota recorded a couple of days ago. Yikes. But, as a result of the sun peaking in and out of the clouds my sunglasses are on and off my face constantly. And if I am not wearing them I am holding them, or have them on my head, or hanging them from a belt loop, or in a pocket. Hence the reason I end up losing, or breaking so many pairs. Now what I don't understand is where the heck the reciprocity is. You would think that eventually for every, or nearly ever pair I lose, that I would also find a few nice pairs. Maybe even one. For some reason this is not happening for me. Perhaps off the coast of Washington, in the middle of the Pacific Ocean, there is an underwater swirling vortex of sunglasses the size of Texas. Don't laugh, it happened with plastic grocery bags. But now that I have once again lost my nice fitting pair of cheap sunglasses, I am forced to carry around my back-ups. And they make me look like a complete moron. At least that's what I was thinking as I looked in several windows that I walked by on my way to my car this afternoon. Of course that made me actually look like a moron I'm sure. Hopefully my luck will turn soon and I will find another nice pair soon. Perhaps one that some other poor Seattle schmuck lost because of our on and off sunshine. That, or I'll have to get a pair of those cloth straps for my neck. But I never liked those. So tell me readers. How often do you lose your shades? The Star Wars Talk - I'm Ill Prepared. I'm sure many of you have already seen this hilarious talking to your kids about Star Wars PSA. If not, please take the time to watch it now because it's pretty funny. Now that you are up to speed, I have a small leeetle confession to make. It's nothing really. Not sure if it is even really worth mentioning, but here goes. Despite what the title of this here blog might indicate, I would have by no means been qualified to star in this PSA myself. That's because, though I do enjoy the films I am not a - how do you say it - 'dedicated' fan. Hey! Alright, who threw that shoe at me? You, in the back. Yes, you. Please put down the pitchfork and consider that I have a young child. The truth is, even though I have watched all six films, Star Wars and The Empire Strikes Back are the only two I have even watched a second time, and it has been at least 5 years since Empire (see, I don't even call it Episode V) which was the last one I watched. In fact, it wasn't until after Episode I came out, which was during the lovely Mrs. LIAYF and my honeymoon, that I had actually watched the original Star Wars movie. (Do I earn back a few of my rapidly diminishing geek points by admitting we watched it during the honeymoon? On Maui? No?) One of my first movies at a theatre was Empire and I, along with everyone else I knew, watched Return of the Jedi when it was released. But it wasn't until I watched the original that the plot line made real sense to me. So that leaves me where I am today. A fan of Science Fiction movies, and a dad with a Star Wars themed blog title. But a Star Wars Geek? Unfortunately, not. I say unfortunately because I wish I had watched the movies several more times each. They are fun and the cult culture around them is undeniable. And, of course, this has led to Star Wars having a pretty big presence for our kids as well. Even though we don't have television, and Lukas gets amazingly little media for a 4 year old kid, he is exposed to Star Wars. He has Star Wars clothes, Star Wars bobble heads, and a few other Star Wars toys as well. Plus, the neighbor boy has a set of Lightsabers that he generously shares with Lukas. He likes these things so much so that last night, Mrs. LIAYF actually ordered him his first Lego Star Wars set, an X-Wing Fighter, that was supposed to arrive with our groceries this morning. However, what was in there was actually a Lego Star Wars board book that loosely followed the plot of the original film. Nonetheless, he loved the book, showing off to all his friends at pre-school and pointing out who the 'Bad Guys' were, and saying things like "This is the Deaf Star!" And, as Lukas implored me to read the book to him in the parking lot of his pre-school, I found myself becoming re-familiarized with the plot, and also some of the trivia surrounding it. for instance, did you know that the little brown robed rodent like guys that salvage and sell robots (like C3PO and R2-D2) are called Jawas? And the desert planet was Tatooine? Yeah, I thought you did. Now that he's 4, if I am going to have the talk with Lukas about Star Wars, I had better brush up myself. And decide whether or not to tell him who Luke's Father really is. Even though there is no longer an official Random Tuesday Thoughts, I have a lot clanging around up in the LIAYF attic, therefore I decided to Think Out Loud today. I turned on the radio on the car ride home Monday evening to NPR news. Normally when this happens, within mere seconds the words 'kill' or 'bomb' have caught Lukas' attention, so I turn it right back off. But not this time. This time we tuned it on to a story about the last Space Shuttle mission. "The last mission?" my little guy said. 'Ahhh, I wanted to see that..." So we went right home and did just that. We were at a local park a couple days ago. Lukas was playing nicely with another boy when a squirrel ran onto the playground. The boys mother immediately called out to him "Gaylen, stay away from that squirrel, it has sharp teeth and might bite you!" An instant later, I realized that kids don't often forget what you teach them - as Lukas yelled "Squirrel for dinner!" and took off after the furry rodent laughing with the other boy at his heels. "Uh...sorry about that" I smiled at her, as the boys treed the beast. I'm banking that he will never actually get close. On the way home from work and preschool we pulled up next to a city bus. "The people on the bus look really sad, really sad, really sad" I sang. Lukas thought that was funny, so I followed with "The boy in car likes Daddy best, Daddy best, Daddy best". "No. I like Mommy best" he quickly responded. You can't blame a dad for trying. and breathes new life into your efforts. Can't say I am actually deserving with all the great sites I follow, but wow. For those of you new to the Internet, this is where you would click on the frog. "Daddy you need to be quiet and sneak out in the mo﻿rning so me and Mommy can sleep in" Lukas said to me, matter-of-factly, last night. "What about me?" I replied "Can't I sleep in too?" "No, you need to go to work." he admonished me. "Or you won't get any money." It seems he has it all figured out. And finally, now that my blog is in its 4th year, I get a fairly constant stream of pitches to review products or alternatively do PSA's. Honestly, I am reluctant to post to many of those here at LIAYF so instead I have created my own review and giveaway site. In a stroke of original brilliance I decided to title the site......wait for it......'Luke, I am your Father Reviews'. I am from crossing the Oregon Trail, settling on fertile ground, and clearing the land one mammoth fir at a time. I am from blisters on your thumbs, dirt under your fingernails, and sweat on your neck. I am from building a home and a farm, and raising a handful of generations there. I am from getting up before the sun rises, hidden behind grey rain-soaked clouds over not so distant timber covered hills. I am from hot summer afternoons, hay bales as far as the eye can see, and a chocolate shake after the last one goes in the barn. I am from 12-inch trout, a river runs through it, and swimming on hot days in the icy mountain water as it meanders slowly past. I am from Sunday afternoons, the constant variety of sports, and sudden outbursts of genuine emotion. I am from small gymnasiums, the squeaking of sneakers, hoop dreams, and guaranteed playing time. I am from co-ed dorms, choosing majors, late night parties, No-doz, and pomp and circumstance. I am from returning home, real world troubles, and working 16 hour days. I am from finding true love, tough decisions, and saying goodbye. I am from changing directions, changing perspectives, and spectacular views of city skylines. I am from tearing off trim, pulling carpet staples at 2 in the morning, late night kisses, bucket loads of paint, and yet another trip to The Home Depot. I am from years of trying, utter disappointment, resignation, shock, and the overwhelming emotion of a little pink line. I am from sleep deprivation, family hugs, stories by flashlight, and uncontrollable laughter ringing out in all directions. I am from realizing my astonishing good fortune, taking nothing for granted, and finally understanding just why it is I'm here. So tell me. Where are you from? Note: I came across this Meme by reading amazing entries by TwoBusy, ZenMom, and SFD. I sat down and wrote this last night before I realized there was a template to guide me. As a result, the finished product was something altogether different. But I liked it, so decided to leave it as is. We picked up some Transformers walkie talkies at a local thrift store this weekend. There were 4 of them, and surprisingly they all still worked. Immediately, Lukas wanted to turn them on and play something with them. I didn't blame him one bit as I kind of wanted to play with them too. So, after a brief introduction to the basics of walkie talkie use we were ready to test them out. "Say something funny Daddy!" came his request from just a few steps away in our living room. "Something funny" I replied holding in the red button on the side as I spoke. Through the crackling of the speaker came a chuckle and a giddy "Roger dat, Daddy". It seemed we were ready for business. Lukas then grabbed Mrs. LIAYF and together they made their way to our backyard and into a waiting large cardboard box rocket ship. Holding down the red button from the deck I called out "Rocket ship 1, this is Mission Control. Prepare for blastoff to the Moon"
"Ready Mission Control" my Transformer crackled. Then, just as I was about to start my countdown a garbled message came through the speaker of my talkie. It was a man's voice, barely audible. As I struggled to figure out and what it was saying, it stopped. I couldn't help recalling the story I'd heard about the mom with the baby monitor who picked up a video feed from the International space station. But the message had stopped, so I continued my duties as Mission Control. "Mission Control to Rocket ship 1. Blasting off in 10, 9, 8, 7, 6, 5, 4, 3, 2, we have ignition. And liftoff of Rocket ship one headed towards the Moon. Velocity 1000 mph and climbing" I continued. But once I released the button, the garbled message seemed to start all over again. I listened more closely this time. "Something, something, November Eighty Seven" it repeated. Then again. November 1987? I wondered what that meant. Maybe this was a radio signal from back in 1987, returning from the planet Vega - complete with hidden plans to build a complex space travel machine. Or, alternatively could this be a desperate looping distress signal first sent out back in 1987. One kinda like the one sent out by that crazy French woman on LOST. "November Eighty Seven, this is Mission Control. Over" I called into my Transformers talkie. "Do you read?" Then, some more barely audible garbled words emanated from the tiny speaker. 'Foxtrot' might have been one of them, but it almost sounded like a reply. "November Eighty Seven. Over. What is your position?" I repeated insistently, releasing the red button. "Daddy! Daddy! We are at the Moon. We are at the Moon!" Lukas' excited voice interrupted through the speaker. "Explore. Report back." I succinctly replied, before returning my concentration to the odd message. "November, Eighty Seven" I continued "Please verify your status. Over. This is Mission Control. Over. Please clarify, and reveal your position." But the message seemed to only loop yet once again. Then, as Mrs. LIAYF walked up to me, not getting any response I disappointedly said to her "I don't think they can hear me." "You better hope they can't" she laughed. "It's probably the air traffic control....or even the military." And I guessed that was true enough. Glancing around the perimeter of our yard just to be sure I wasn't being watched, I decided to give up trying to communicate with November Eighty Seven. Besides, Mission Control didn't need anymore distractions. After all, there was a return mission from the Moon to coordinate. "Rocketship 1, are you ready to return to Earth?" "Ready Daddy." my Transformer talkie crackled. Few people know the real reason America fought for it's Independence from Great Britain way back in the 1770's. Taxation without representation? Important sure, but not the issue that really stuck in the craw of the colonists. Actually, I have it on good authority it was because King George III declared there would be absolutely NO kid parades. It's only because we, as a collective people, rose up in revolt all those years ago and declared "You're not the boss of us!" that countless parents can now get up early on the 4th of July and walk patriotically though the streets next to their rolling children. Today we celebrated our right to have kid parades, and had a lot of fun doing it too! For my next trick, I will jump 20 barrels and a bus. Happy 4th of July US readers! So tell me how did you spend your ﻿holiday? Did you partake in any parades, or fireworks? I have been a huge baseball fan nearly all of my life. All types of baseball really but particulary the show, and my hometown team, the Seattle Mariners. Sure, I'm a fan of football and basketball as well, but for me there are many things distinct about the game of baseball which make it like no other sport. The sounds, the smells, the history, and the anticipation that builds before giving way to the critical play all add to the richness of experience I take away from watching or more often recently, listening to, my favorite game. It is only natural then that, as a father, I want to share these experiences with my son. I can even now envision the day when I'll be able to attend a game with him and a son, or daughter, of his own. Lukas is 4 years old now, and now seems like the right time to begin taking him to more games to watch. Before now, with his nap and sleep schedule as well as shortened attention span, the time never seemed quite right to load up and take him to the ball park. The couple games we did attend before he was 1 were not for his sake, and frankly his being along made it difficult to focus on the game. So, since then we hadn't actually attended a big league game. That all changed yesterday however, as Mrs. LIAYF and I took Lukas to the Mariners game against the Padres from San Diego. We arrived early and entered Safeco Field through the Team Store. We entered there because as we were getting ready for the game - packing sandwiches, water bottles, fruit, and of course peanuts - we realized Lukas didn't own a Mariners shirt. That had to be remedied. Mrs. LIAYF, not a huge fan, first grabbed a Chone Figgins shirt. NO! I shouted. After getting the Ichiro shirt, like any good baseball fans, we headed straight down to the field to watch batting practice. Seats here would have been nice. Then, after batting practice and a trip the bullpen to watch the pitchers warming up, we found the kids play area out beyond center field. This proved a great place for Lukas to burn off some steam, and as it turned out we ran into one of his pre-school buddies with his parents there as well. Oddly enough, I later ran into one of my employees and her husband as well as another colleague I had worked with over 5 years before. Finally, as the game was about to begin, we made our way up to our seats. This is where I admit our tickets were free. They were ones I received because I enough of a regular at Starbucks, that I knew when they were having a customer appreciation giveaway. As you might suspect, the tickets were in the nosebleed section. If you look closely you can see Ichiro running into right field in the picture below. That little white dot, centerish. Yeah, that's him. But that didn't matter too much as the seats were bathed in the evening sun, with beautiful views of the city skyline beyond. Plus, I had a another fine view just to my left. Smile at the camera and I'll buy lemonade! For me, the game was a blast. The anemic hitting M's put on a power show scoring six runs by the 6th inning, giving all of us ample opportunities to explain the finer points of the game to Lukas, as well as to teach him how to throw up his arms in celebrations before giving high fives to the surrounding crowd. Truth be told, he was squirming and ready to go by the third inning. But Mrs. LIAYF promised him that if he was patient and let daddy watch the game for another inning, we could go back to the real highlight of the visit to the ballpark for him. He obliged, so we did as well. After another inning of playing in the kid area we were ready to head home, a win for the team, and also for team LIAYF already securely in hand. How about you readers? What events do you enjoy taking your kids too?